– Sarah Dessen, The Truth About Forever. The above bouquet is my latest pride and joy, carefully created for Daphne whose solemnisation ceremony takes place this weekend. I can’t wait to see photos from her wedding! This one took a real leap of faith, with not much to go on, I decided to do something completely different from what I have done with other bouquets so far, and I am so happy that the bride loves the bouquet as much as I do. Soft and airy chiffon peonies, lush roses and my first attempt at the tricky ranunculus, all handmade from scratch, and it was completely worth all the work. If you’d like to view more photos of this bouquet, they are available here. 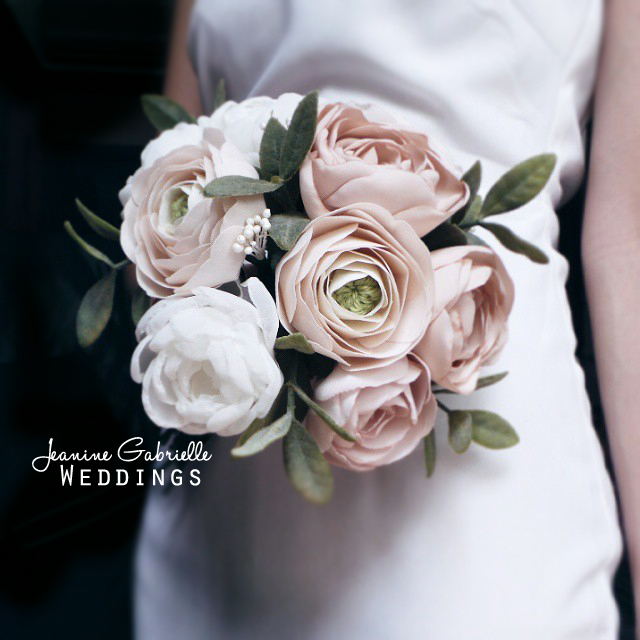 Please contact me at jeaninegabrielle@gmail.com at least 2-3 months in advance if you are interested in a handmade bouquet for your wedding that will last forever, along with memories from your BIG DAY!